Training starts at a young age and that is certainly true for your hyperactive pup that requires a tasty incentive to sit, stand, roll over, stay, down, come, and leave it. What is that tasty treat that will make your puppy listen to your commands? Lil’ Bitz, available in three mouth-watering flavors, will do the trick! 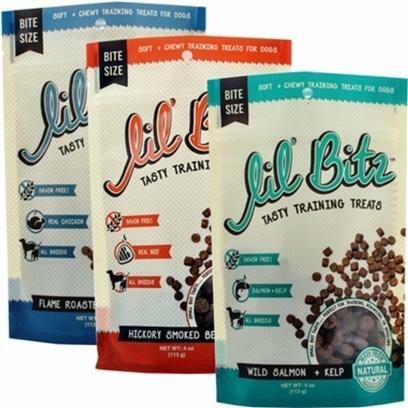 Lil’ Bitz is your answer to transforming your puppy from a naughty, untrained pup into a good and trained pup. Each time they listen to your command, give them a tasty treat as a reward. You can choose from Hickory Smoked Beef, Flame Roasted Chicken, and Salmon and Kelp training treats. As soon as your pup eats one treat, they will look forward to becoming a good boy/girl! You also do not have to worry about puppy putting on the pounds because each treat contains four calories. You can train your dog with ease because their health will remain unaffected. If your puppy did not listen to you before, they will after you give them a taste of goodness! With only four calories per treat and made with grain-free and natural products, the training treats have no reported side effects. Hickory Smoked Beef: Beef, buckwheat flour, vegetable glycerin, dried apple pomace, natural flavors, citric acid, mixed tocopherols. Flame Roasted Chicken: Chicken, buckwheat flour, vegetable glycerin, dried apple pomace, natural flavors, citric acid, mixed tocopherols. Salmon and Kelp: Salmon, kelp, buckwheat flour, vegetable glycerin, dried apple pomace, natural flavors, citric acid, mixed tocopherols. You can use the treats to train, reward, and spoil your dog.